Fleas can be a terrible problem for you and your pets. 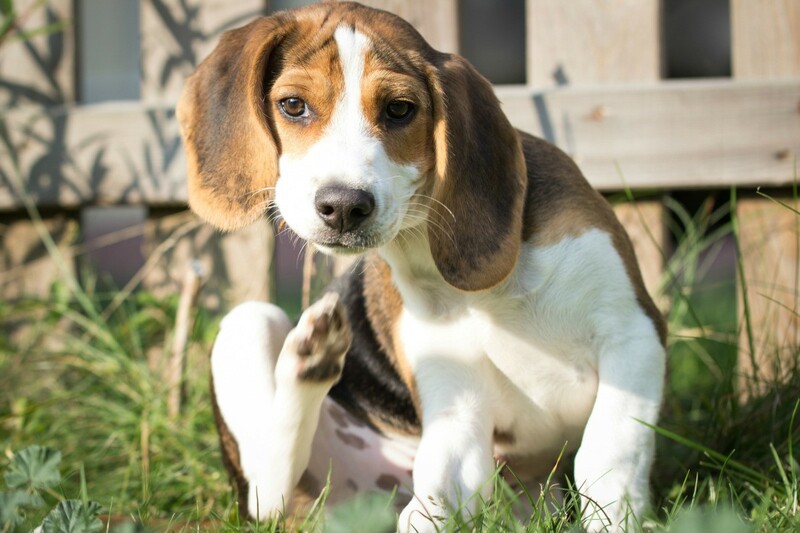 There are a few approaches that pet owners use to keep fleas off of their dogs. Many use commercial topical products, others recommend herbs, such as sage. Flea collars are less popular. Check with your vet before using one; there are prescription collars available. This is a guide about keeping fleas off dogs. What is the best way to rid a dog of fleas? If you dog has long fur and is matted; fleas will manifest in this. I suggest grooming a long haired dog short and bathing it well. Use Frontline TopSpot at early sign of spring (April). Thereafter, apply monthly (My dog's treatment is not that often, but they are inhouse pets and still haven't shown any signs of fleas) You can get a flea zapping comb that works well and kills them the minute it touches but doesn't harm the pet. I bought one at Jefferspet.com and they don't cost that much; use regularly if you don't intend on flea treatment. Avoid Sergeant's brand flea and tick dip, shampoo or collars as they contain harmful ingredient for animals. Human shampoo is not suppose to be used on pets nor strong detergents on a regular basis, keep that in mind if you are planning an inexpensive route to flea maintenance...the pet's skin will become irritated and you've only caused your pet another problem. First of all bathe your dog in Dawn dishwashing detergent. This will kill the fleas immediately. Then rub the dog down with sage. Can someone please help us with our flea problem? They are attacking our dogs. Do an internet search on diatomaceous earth, not the pool kind, for preventing fleas. Brewers yeast is also used in preventing fleas. Sprinkle salt all over the house or baking soda. I like salt. I put it everywhere and let it sit, then vacuum up. Do this two weeks later too, and then if you see any. Vacuum the house all the time and empty the bag or keep a flea collar in the bag, not on the pet! If you need to kill a large infection of fleas of your dog, or cat then use a shampoo and peroxide mixed up in your hand. I use Dawn on really bad cases, let it sit a few minutes if you can and rinse. I would not add the peroxide to the Dawn. I do the Dawn treatment for kittens, but almost any kind of bath will work. Then I comb through them all the time with a lice comb or a flea comb and put the fleas in a bowl of hot water to drown in. Also treat the skin of the dog. Either give him fish oil pills or a little olive oil, 1 tablespoon for big dogs less for little dogs, most of them will lick it off the spoon. I do this every day. When I have leftover meat, that is good for dogs such as hamburger, chicken, etc. I mix it with a few good vegetables and then put a few drops of vitamin drops for infants in it and add mayonnaise, and a little oil and sometimes oatmeal and mix it up. Most dog foods do not have enough meat in them that the average person can afford. When their skin is better the flea problem will improve. If they are outside and I am sure they are, spray the yard. Benadryl is necessary for dogs that have lots of hot spots and I would look at the food and diet and oils and such. If they are getting the wrong food, it can cause allergies to show themselves in the skin. Any dog food without meat as the first ingredient isn't the best food in the world and who can afford to buy Authority? I do buy small bags of Authority and give those as treats, and don't give the garbage treats that they sell as treats. How can I get rid of fleas on my dogs? I really feel you are just wasting your money, unless you have "hundreds" of fleas on your pet and they are running out of blood meals to feed on your pet and are jumping on you. If that is the case, Adams makes a really good flea shampoo and dip to get rid of them on your pet 24 hours before you apply the Frontline. However, let me tell you how Frontline works so you will see that everything else is not necessary: You apply the Frontline in between your dogs shoulder-blades for an inch or two. From that point on the Frontline solution begins to saturate your pet through their sebatious glands of their skin and within 24 hours most, if not all, of the fleas on your pet should be dead, the rest within 48 hours. Fleas need to feed off your pet with a blood meal, which they get by biting your pet. At that point, when they bite your pet, the Frontline attacks their central nervous system and paralyzes them and they die. They never get the chance to lay any more eggs for any more fleas to reinfest your pet.